Back in July I reported the Batman: Brave and the Bold Action League was being re-branded as the DC Universe Action League. A DC Universe Action League pack containing Firestorm and Black Lantern Firestorm was announced during the San Diego ComicCon. Looks like those toys should be hitting stores soon! Below is a photo of that 2-pack, now labeled “Deathstorm vs Firestorm”. It’s worth noting the Firestorm figure is based upon the current Brightest Day version, rather than the Batman: Brave and the Bold version. I’m not sure of the exact release date of this figure set. I know review copies were mailed recently to Action Figure Insider and it appeared in at least one eBay auction here in the U.S. If anyone sees these toys in stores, please give us a heads-up. It would be nice to know when they are released. My thanks to Doug Zawisza (of the Doom Patrol blog) and CJ Writes for sending this information my way! Thanks, guys! Posted in: Brightest Day, Deathstorm/Black Lantern Firestorm, Firestorm #08: Brightest Day (Ronnie/Jason), Toys. I say these along with the GL/Sinestro, Supes/Bizarro and Flash/CAPT Boomerang 2 packs in Target a couple days ago in a Target in Macomb,MI (suburb of Detroit). JP – Thanks for the heads-up! I’ll be checking our local Targets! YES THIS TOY IS OUT THERES TONS OF THEM AT TOYS R US HERE IN CALIFORNIA IN THE CITY OF LA MIRADA !! A friend sent me one in the mail for my birthday. These are awesome. 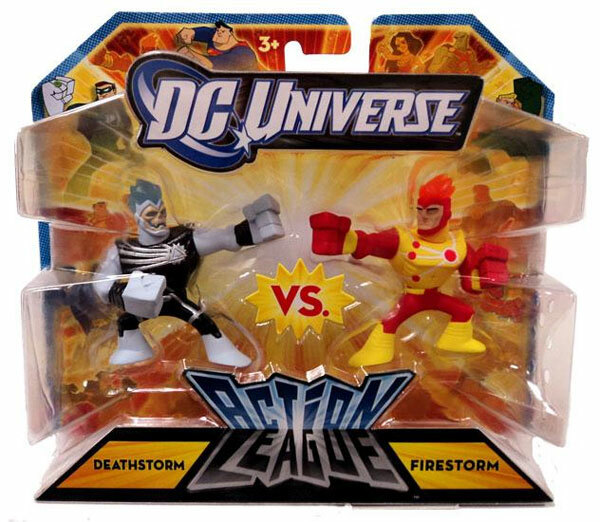 What really tickles me is it’s the Brightest Day version of Firestorm vs. Deathstorm. Which are the characters I worked on for BD. It was a real thrill to see something like this come out.